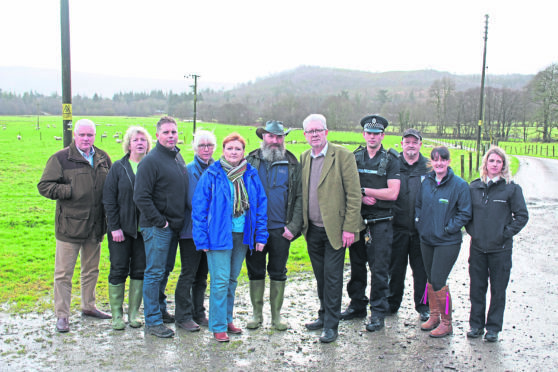 Farmer Brian Walker, (centre, with beard wearing hat) with MSPs Mike Russell and Emma Harper and others involved in the meeting yesterday including police and SSPCA officers. An Argyll farmer who had his sheep viciously attacked and killed in a gruesome dog attack will share his experience with the Scottish Parliament. Argyll and Bute Council and police worked together to secure a conviction in the case of Brian Walker’s dead sheep. It has now has led to improved working practices which could be shared throughout Scotland. Graham Hatton, council officer, and PC Ben Rusden, from Lochgilphead Police Station, are attending the Parliament tomorrow to share their experience of how, with support from SSPCA and local farmers, they successfully tracked the out of control dogs, gathered the evidence and took the owner to court. They will be joined by Mr Walker, of Carloonan Farm in Inveraray, Argyll, who had 17 of his ewes savaged. While six sheep could be saved, four were already dead and seven were so badly maimed they had to be put down. The campaign has widened to provide farmers with signs instructing dog owners to keep their pets under control. Leaflets have also been shared for stock owners advising them on how to preserve evidence in the event of a sheep worrying incident and specific training will be provided for police officers in dealing with livestock attacks. Police, the council, NFU and SSPCA have worked on the campaign supported by local vets and businesses. It runs alongside the SPARC (Scottish Partnership Against Rural Crime) national livestock worrying campaign. 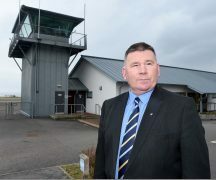 Inspector Julie McLeish of Lochgilphead Police Station said: “I would like to thank local farmer Brian Walker for his support for this campaign and championing it amongst his peers following the savage attack that took place on his flock caused by two large dogs that were uncontrolled. Councillor Roddy McCuish, Policy Lead for Roads and Amenity Services, said: “The council is delighted to be part of this initiative and to share our experience with others. “We must prevent livestock worrying and remind dog owners to be responsible for their pets. “Dogs must be under control at all times and should be on a lead when near farm animals. Emma Harper MSP is launching a public consultation on livestock worrying tomorrow.